Go to www.VisitBeloit.com for restaurants, shops and attractions. ICE: Please contact the Front Desk for assistance with ice.............. Dial 0 IRONS/HAIR DRYERS: Each guest room is provided with a hair dryer in the bathroom and an iron and ironing board in each closet. FIRE SUPPRESSION and SMOKE ALARM DEVICES: Ironworks Hotel is fully equipped with fire and smoke alarm devices. However, for additional safety, please familiarize yourself with the exit routes and fire safety guides, found on the entry wall of your unit. GUEST LAUNDRY: Enjoy the convenience of our complimentary guest laundry facility, accessible 24 hours with your room key card. Ask the Front Desk for complimentary detergent. Guest laundry facility is located on the lower level of the hotel. Please press LL in the elevator to access the lower level. NEWSPAPERS: Wall Street Journal is offered each weekday morning in the Lobby. 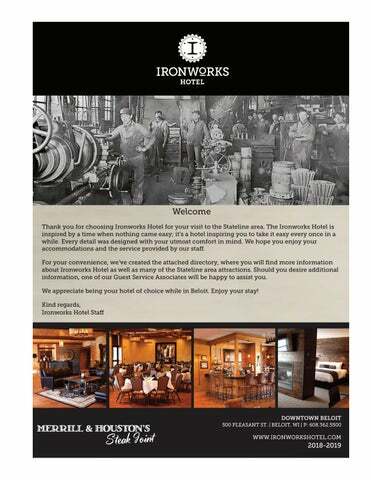 SMOKE-FREE: Ironworks Hotel is proud to offer a 100% smoke-free environment. Please be advised, due to the additional costs of restoring a room to smoke-free condition, rooms which have been found to be smoked in will incur a minimum $250.00 cleaning fee. PHARMACIES: CVS.............................. Dial 8+362.4566 Homecare Pharmacy ......................................Dial 8+362.1234 Walgreens.................Dial 8+365.2286 RESTAURANT: Merrill & Houston’s Steak Joint - with its rustic feel, hardwood floors and abundant photographs capturing historic Beloit - has branded itself to tell a great story, but most importantly its focus is on the classic steakhouse with the highest of quality steaks and seafood with down-to-earth and attentive service that makes you feel like you are at your best friend’s home. The classic look, rustic theme and the uncompromised quality of the food and service are the perfect recipe for an unforgettable night out. Live music in the bar on Fridays. Fire Safety & Security Take Precautions! 1. 2. 3. As soon as you check in, look around and decide on an emergency escape plan. Locate the nearest fire exits and fire alarm and count the number of doors between exits and your room so you can find them in the dark. Always keep your key handy near your bed. Study your room for escape routes and always take your key if you leave in an emergency. Carry a small flashlight, if possible. Avoid panic. Panic and smoke are your worst enemies. KNOW WHAT TO DO IN CASE OF FIRE. In Case of Fire, Act Fast... 1. 2. Report smoke or fire to the Hotel Operator immediately. Dial 0. State your name, room number and give a brief description of the situation. Feel the door. If the door or knob is hot, don’t open it. If You Stay In Your Room… 1. 2. 3. 4. 5. 6. Stay low to the floor and tie a wet cloth over your nose and mouth for easier breathing. (Note: this won’t filter out deadly gases.) Signal for help by using telephone, waving a sheet, flashing lights, etc. Emergency number is 911. Fill the bathtub with water. Stuff wet towels and sheets in cracks around doors and vents. Turn off air conditioners and fans. Vent any smoke from the room using the bathroom vent (unless it draws in smoke). Open window if there’s no smoke outside. Don’t break glass unless absolutely necessary - you may need to close it later. Throw water onto hot surfaces (walls, doors) using ice bucket or a wastebasket. Remove curtains and wet down window if fire is right outside. Don’t jump from above the second floor - you could be seriously injured. Wait to be rescued. If You Decide To Leave Your Room... 1. 2. Take your key, keep a wet cloth tied over your nose and mouth, close door behind you and yell or knock on doors to warn others. STAY LOW. If there’s no smoke, walk to the nearest smoke-free stairway. If there’s smoke or it’s dark, crawl to exit, counting doors. Never Use An Elevator In a Fire - You Could Become Trapped Inside! These recommendations are to be construed only as suggestions. Use your own best judgment. The safety and security of your personal property are of the utmost concern to us. We urge you to take advantage of the following suggestions. DOUBLE LOCKS AND CHAINS: For additional security, while in your room, utilize the deadbolt lock provided on your door upon entering. This will prevent the door from being opened by a regular room key. As an additional precaution, please secure the safety chain lock. ADMITTANCE: Do not admit persons to your room without first making identification. A viewer is provided in your door for your convenience. If there is any doubt about the person’s identity, please contact the Front Desk. REGISTERED GUESTS ARE AUTHORIZED FOR ROOM KEYS ONLY: Photo I.D. required. KEYS: To provide you with a worry-free stay, your key is encrypted with an RFID code to provide access to your guest room or suite. FIRE: Please familiarize yourself with the location of the nearest fire exit stairway. In the unlikely event of a fire, please move quickly, but calmly, to the stairs. Avoid the use of elevators. Report fire or smoke to the Operator. Points of Interest BELOIT COLLEGE 608.363.2000 This institution offers the majority of its sight-seeing and cultural activities to the public, free of cost. BECKMAN MILL Cty. H, 6 miles west of Beloit on Hwy. 81 11600 West Cty. Rd. H, 608.368.1435 www.beckmanmill.org 1:00 p.m.-4:00 p.m. Saturday & Sunday, May-October. (Group tours by appointment.) Donation suggested. Bring a picnic lunch and sip lemonade by the “old mill stream” after you tour Beckman Mill. Listed on the National Register of Historic Places, Beckman Mill is one of Wisconsin’s only restored, working gristmills. Built in 1868, the mill has been restored to how it looked and operated in its heyday in the 1920s. The mill also has a newly rebuilt dam, a one-of-a-kind fish ladder, picnic area with shelter and wildflower garden. A must visit during Heritage Days in the fall. BELOIT COLLEGE’S LOGAN MUSEUM OF ANTHROPOLOGY Memorial Hall, Beloit College Prospect Ave. & Bushnell St., Beloit 608.363.2677 www.beloit.edu/~museum 11:00 a.m.-4:00 p.m. Tuesday-Sunday, closed Monday & college holidays. Free admission. (Group tours by appointment.) View artifacts from around the world at the internationally renowned Logan Museum of Anthropology. Displays include Native American baskets, Pre-Columbian and Prehistoric Native American ceramics and archaeological specimens from the Beloit vicinity. Roy Chapman Andrews is a significant figure in the history of the Logan Museum and is one of the College’s most famous alumnus explorers. Many believe that Andrews was the model for the popular “Indiana Jones” character because of his life-long adventures. BELOIT… A New England legacy left behind and reflected in the architecture, natural beauty and charm of this ever-growing city. Because of the advantageous location of Beloit on the Rock River, it is rapidly becoming a major manufacturing, warehousing and distribution point for many companies. Farming is the secondlargest industry of the area. Enjoy the famous recreational opportunities of Wisconsin. The beautiful rivers and lakes provide fishing, sailing, boating and panoramic landscapes for skiing, hunting, hiking and snowmobiling. This is all close at hand in the Beloit area to provide something for everyone. Points of Interest op group of artists’ studios. The art gallery showcases both resident artist works and traveling exhibits. Classes and special exhibits held throughout the year. EFFIGY MOUNDS Beloit College Campus 700 College St., Beloit Take a self-guided tour of Beloit College to discover the 23 conical, linear and animal-shaped effigy mounds scattered throughout the campus. Built around AD 700 to AD 1200 by Native Americans, the mounds are believed to have helped define territories, build family unity and, in some cases, were used as final resting places for tribal members. Once estimated to number as high as 20,000, the Beloit College Effigy Mounds now represent only a few of the less than 3,000 remaining mounds in North America. Many tools and broken pottery excavated can be seen in the permanent collection of the Beloit College Logan Museum of Anthropology. ROCK RIVER PHILHARMONIC 444 E. Grand Ave., Beloit, 608.313.1200 www.rockriverphil.org 10:00 a.m.-4:00 p.m. Monday-Friday. Admission charged. The Rock River Philharmonic is a professional orchestra offering three distinct concert series: classical, family pops and explorer. These distinct concerts reflect the interests of our communities and allow us to explore artistic boundaries while also celebrating artistic achievements. Call or check our website for schedule. BELOIT SNAPPERS MINOR LEAGUE BASEBALL Pohlman Field at Telfer Park 2101 Cranston Rd., Beloit 608.362.2272, 800.SNAP.2.IT www.snappersbaseball.com America’s favorite pastime at its best! Enjoy major league fun at minor league prices at a Beloit Snappers game, the Class A affiliate of the Oakland Athletics. Groups of 25 or more can tailgate without the car in the catered picnic area with advance reservations. Season runs April through early September. Call 608.362.2272 or 800.4.BELOIT for a game schedule, ticket information and directions to Telfer Park. HANCHETT BARTLETT HOMESTEAD 2149 St. Lawrence Ave., Beloit, 608.365.7835 www.beloithistoricalsociety/hanchett.htm 12:00 p.m.-4:00 p.m. Tuesday-Friday. Admission charged. (Groups by appointment.) Step back in time and view how life was in the mid-1800s in the artfully restored 1857 Victorian homestead, barn and 1873 one-room schoolhouse. Fine period furnishings and a newly restored kitchen show how “the upper middle class” lived at the turn of the century. In the fall, Heritage days offer a full weekend of fun. BIG HILL PARK Afton Rd. & Big Hill Rd., Beloit 608.364.2890 Summer: Dawn-9:00 p.m. Winter: Dawn-Dusk Designated as a tribute to the men and women who served in America’s wars, the park is one of Beloit’s most scenic sites. Located on the bluffs of the Rock River, this 190-acre park boasts nature and hiking, an environmental education center, picnic shelter, restrooms, play equipment, cross-country ski trails and a scenic overlook with spectacular vistas. Points of Interest KRUEGER-HASKELL GOLF COURSE 1611 Hackett St., Beloit, 608.362.6503 www.kruegerhaskellgolf.com Daily 7:00 a.m.-6:00 p.m. or 7:00 p.m. Closed for the season in early November. Krueger-Haskell Golf Course is located on the west side of the City of Beloit. It was originally opened as a nine-hole course on May 1, 1927. It was enlarged to 18 holes in 1931. Since its initial construction, the course has been renovated several times. A new irrigation system was installed in the mid-1990s, and it continues to evolve with added improvements and maintenance practices. A unique layout, mature trees and rolling terrain make it a challenging and enjoyable course for any level of golfer. HERITAGE WALKWAY Riverside Park, Riverside Dr., Hwy. 51, Beloit Take a walk through history along Beloit’s Heritage walkway, an engraved brick pathway which is located in Riverside Park along the Rock River. Beloit area residents purchase bricks to commemorate loved ones or special occasions. Hundreds of engraved bricks have been laid to make up the heritage walkway, helping to create a chronological mini-history of the Greater Beloit Community. Each May and September, additional bricks are added to the walkway. KRUEGER POOL 1611 Hackett St., Beloit, 608.364.2877 Admission charged. Closed for the season in September. Krueger pool features a main pool with rain dropper for swimmers’ enjoyment. New additions include two basketball hoops. Children seven and under must be accompanied by a swimming adult. A Deep-Water Tag is needed to swim in the deep end of the main pool. Krueger pool also includes a diving pool. The diving pool has one 1-meter diving board and a drop slide. A Deep-Water Tag is needed to use the diving pool. In addition to the two pools, Krueger also features a spray-ground. The spray-ground has an exciting interactive area with amenities and spray action. STONE WATER TOWER AND WATER WORKS PUMP HOUSE 1003 Pleasant St., Beloit, 608.365.4838 Summer (May 31-Sept. 1): 7:00 a.m.-5:00 p.m. Winter (Sept. 6-May 27): 8:00 a.m.-1:00 p.m., 2:00 p.m.-5:00 p.m. Monday-Friday. Built in 1885, the pump house was the site of Beloit’s first municipal water system. Restored in 1992, it houses the City of Beloit Department of Leisure Services. Built in 1889 and on the National Register of Historic Places, the stone tower is a visible community landmark and a great photo opportunity for camera buffs. RIVERSIDE PARK Riverside Dr., Beloit, 608.364.2929 Located on the banks of the Rock River, this 23-acre park is home to the famous Turtle Island Playground; the Beloit River Walk, a 3.5-mile paved walk and bike path around the Rock River; the Harry C. Moore Pavilion; and the Rotary River Center. The park also features ice skating on the lagoon, a picnic shelter, play equipment, lighted tennis courts and restrooms. Bicycles and paddleboats are available for rent, in season. buildings they replaced. In this year, about 150 men were employed, working on paper machines that sold for $25,000 to $30,000 each. Buyers of Beloit paper machines before the turn of the century were generally companies in the Great Lakes region, but in 1897, a machine was shipped to Japan, and two went to China in 1900. Beloit had become well-known in the industry, nationally and internationally. Alonzo Aldrich kept the company in the forefront of the industry. One of the bright young men he hired was Elbert H. Neese, his son-in-law, who at just 30 years of age was vice-president and sales manager of a competitive machine builder. Elbert quickly became a strong factor in the management of the company, and with his help, Beloit Iron Works increased sales rapidly. In 1916, when he came, sales were at their record highest up to that time; in the next 15 years, they grew eight-fold. Employment reached a peak of 550 in the year 1930. Alonzo Aldrich died in 1931 and was succeeded as president by Elbert Neese Jr. He was faced with the worst years of the Great Depression. Orders for machines were non-existent, and parts and repair orders were scarce. The work force shrank to 180, and gradual recovery took place the following years until 1937, when employment reached a temporary force of 640. In 1941, Beloit Iron Works turned part of its production to war materials, building machine tools needed for war production. By 1942, nearly 100% of its capacity was being used for crankpin-turning lathes, boring mills and powder mills. The Iron Works received the Army-Navy “E” for Excellence Award in November of 1943 and three times thereafter. Ownership of the company changed several times in the next 20 years, and finally management difficulties resulted in receivership in 1882. On January 7, 1885, the assets of the company were sold at auction. A successful bid of $20,000 for part of the plant and the real and personal property was placed by J.D. Rexford of Janesville. Then in July, four employees of Merrill and Houston associated themselves to form a new corporation, and Beloit Iron Works was in business. The President of Beloit Iron Works was Fred Messer, who had been superintendent at Merrill and Houston. Alonzo Aldrich became secretary, William H. Grinnell became treasurer and Noble J. Ross became superintendent. The newly organized company had 10 employees, and it managed to get nearly $20,000 in sales that first year. Though there were no orders for paper machines until 1887, orders for parts and other products were so good that by October of 1885, 48 persons were employed. By 1889, about 100 men were working, and the officers were able to buy all of the property of the old Merrill and Houston Works. The company prospered. Beloit Iron Works advertised that it could build a paper machine every 30 days. Unexpectedly, in September of 1889, Fred Messer died of pneumonia at the age of 40. Alonzo Aldrich, then 31 years old, succeeded him as president. It was during this war period that the National Labor Relations Board ordered an election and the International Association of Machinists, A. F of L., was recognized as a bargaining agent for the machine shop employees, the first union to be recognized by the Beloit Iron Works. The work force was growing rapidly during the prosperous period. There were about 1,000 employees in 1946, 1,300 in 1947 and 1,450 in 1948. Employment reached 1,690 in 1952, the year in which Elbert Neese, Sr. became Chairman and Harry C. Moore, who had started work at Beloit in 1937, became president. Dynamic and charismatic like Mr. Neese, Moore also shared a keen interest in expanding sales. The company spread its wings with the opening in 1949 of a sales office in Paris to promote Beloit machines throughout the world. During the 1950s, a fifth of all shipments were to foreign countries. A West Coast sales office was opened in Oregon and Alabama. Purchase of the foundry facilities of the Downingtown Manufacturing Company in Pennsylvania in 1955 was the first of a series of acquisitions to increase production and to diversify. Next was a factory in Italy, then E.D. Jones & Sons Company in Massachusetts in 1958. Beloit machines was soon being manufactured in England, Japan and Spain in production facilities owned or licensed by Beloit. Important in the development of the company was the establishment of a research facility in Beloit in 1955 and the 1961 completion of a Research Center in Rockton, Illinois. Beloit Iron Works was enabled to focus its ability to innovate and to further enhance its technological leadership. The name “Iron Works” no longer seemed to describe the company’s activities and further diversification was planned; the company officially became “Beloit Corporation” on January 1, 1962. Its beginnings are traced to the year 1858, 22 years after the founding of Beloit, when Orson E. Merrill came to Beloit from Vermont and started a foundry at 637 Third Street. Within a year he took in a partner, George Houston, and the firm became known as The Merrill and Houston Iron Works. Its principal product was a water wheel developed by George Houston, but the firm could also supply horseshoe nails and a variety of other iron products. Orson Merrill’s brother, Sereno T. Merrill, owned the Rock River Paper Mill Company, situated close to Merrill and Houston on the Rock River. In 1860, Sereno Merrill asked his brother to make parts for his paper machine. The quality was good, and the parts did not have to come all the way east as before. By 1862, Merrill and Houston was producing complete paper machines along with water wheels and other iron products. No history of Beloit can be complete without the story of the Beloit Iron Works, subsequently named the Beloit Corporation. • Famous Burgers • • Juicy Ribeye Sandwiches • • Homemade Onion Rings • Kitchen Opens Daily 11 a.m. Sunday 8 a.m. Sunday Breakfast 8 a.m. - 1 p.m. $2.00 Bloody Mary Bar $2.00 Screwdrivers Happy Hour... Monday - Friday 4 p.m. - 6 p.m.
Est. 1994 Celebrating 25 Years! Sun 8 a.m. - 12 a.m. Mon-Thur 11 a.m. - 2 a.m.
BELOIT • 1765 PARK AVE.
Fri & Sat 11 a.m. - 2:30 a.m.
East on Broad St. (Hwy 251) Past Walgreens & Turtle Tap, across railroad tracks. Unauthorized reproduction of this directory is prohibited. Daily Lunch & Dinner Specials Daily Drink Specials Happy Hour Monday - Friday 2 - 6pm Beloitâ&#x20AC;&#x2122;s Home For Live Entertainment 4 Nights A Week Downtown Beloit - 132 W. Grand Ave.